THE Order of Australia Association, Mornington Peninsula Regional Groups Annual Schools Award Prize has been running for the past 17 years. The award is open to Secondary Schools within the boundaries of Frankston City and the Mornington Peninsula Shire, involving students from years 10, 11 and 12. For the 2016 Schools Award Prize the Mornington Peninsula Regional Group invited submissions from 27 Schools for a program that exemplifies pride in responsible Australian Citizenship, by improving the quality of life in our local communities. The Winning School receives $1000.00 and an engraved plaque; the School placed second receives $500.00 and a framed certificate and the School placed third receives $250.00 and a framed certificate. 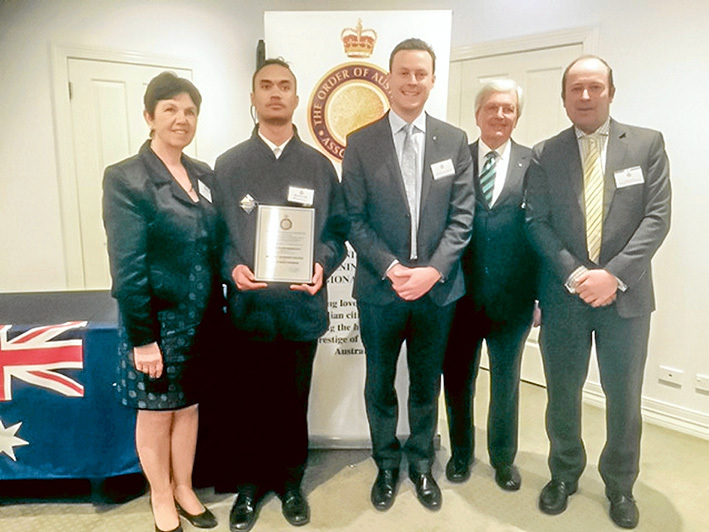 Monterey Secondary College’s 2016 winning project was titled “VCAL Connect” its introduction followed much research, investigation and consultation as to the needs of Monterey Secondary College students resulting in 2015 to a complete revamp of the focus of the VCAL (Victorian Certificate of Applied Learning) program at the College. The Monterey Secondary College has a strong focus on the role that VCAL plays in the strengthening of the College outcomes. It is based on two streams, one a VCAL Industry Connect, where Students have been partnered with Parks Victoria and the Green Army one day each week to assist in clearing regrowth vegetation in the Pines Flora and Fauna Reserve in the Frankston North. This Park is managed by both Frankston Council and Parks Victoria. The second VCAL stream is Sport Connect, where the students have worked closely with the NRL, AFL and FFV (Soccer) to develop skills and competencies to qualify as Junior and Youth coaches for the major codes. Monterey’s response to the needs of its students and their community has a high priority in the daily life of the college, which is underlined by not only the very strong community work of the VCAL program, but by the whole focus of Monterey Secondary College’s ethos. Second Prize went to Elisabeth Murdoch College for their project titled “EMC QSA Action Group”. The QSA Action Group continually strives to raise awareness about homophobic bullying and the impacts on mental health that this has, and challenging all homophobic or transphobic language and behaviour. This has included talking to staff about ensuring they continue to raise standards around this issue. This program that started some two and a half years ago addressing the issue at school level, has now been extended to the wider community through involvement with the Peninsula Pride Group, support of the initiatives of the State Government and the Frankston City Council. Third Prize went to Mornington Secondary College for their project titled “The College Ambassador Program”. This program is designed to develop leadership skills and involve and engage students in School and Community life. This is done by providing opportunities for the students to develop skills in public speaking, organising events, fund raising for community causes, planning and chairing meetings. The program is led by the year 12 Captains and Vice Captains and is functioning across years 7 to 12, and is showing positive results within the College, improving the quality of life of the individuals and the college community. Following some positive feedback, the College believes that in time, the program will develop a broader perspective about contributing to the wider community.